I’ve been asked to write a bit of a blog entry about distance teaching, to accompany the attached video of my talking head! So here goes nothing. I started distance teaching out of necessity after the earthquake. I went on to set up a distance philosophy course (PHIL110) that’s been going out to schools (and more recently regular distance students) ever since. I’m now thinking of setting up a couple of 200-level distance courses. Is it a big job setting up a distance course? Yes!! Set up PHIL110 consumed hundreds and hundreds of hours. What are the upsides? You get more students (although so far the numbers of distance students haven’t been all that stunning, admittedly!) You are forced to think creatively about assessments (since exams are a logistical nightmare in a distance course). You end up with a really good, well-organised course, that pretty much runs itself (if you do it right!) The work you put into the course makes the course better for all students, not just the distance students. All and all, it is a huge learning curve, and so of course you learn a lot by doing it. What are downsides? Number one is the huge amount of time it takes up-front to get such a course on-line and working smoothly (thinking about how to make the Learn site self-explanatory, finding online content, creating quizzes, designing online assessment tasks, etc…). Providing pastoral care to students who aren’t on campus can be a big deal. And there are lots of other issues–like, for instance, the fact that on-campus students tend to skip lectures if they can access videos of the lectures online. If you’re thinking of setting up a distance course and you’d like to look at some existing distance courses in order to get a sense of what works and what doesn’t work, please drop me an email! 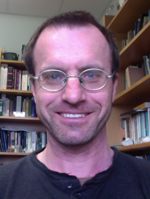 I can give you access to PHIL110, and perhaps some other distance courses too. To see more videos please visit the Sharing teaching Practice page. If you are a UC staff member or student, you are almost certainly using Learn, since nearly 100% of UC’s undergraduate courses have an online learning environment in Learn. Learn is the University of Canterbury’s Learning Management system which is based on Moodle, an open source software platform used worldwide. Learn is being used in a variety of ways across UC, from sharing of resources and communicating with students, to engaging students in online self-paced learning with blended and distance courses. One of the most useful features in Learn (and commonly used) is the Gradebook. It is a powerful feature which – if set up properly – can provide teachers and students with a clear overview of all assessed items and grades in the course. It can calculate course totals based on different aggregation methods and provides teachers with the opportunity to export grades. But how can you set it up properly? Below is a list of steps you can take to get you started. What types of assessment is your course going to have? E.g. Essay, online quiz, participation. What is the weight of each of the assessments? What is each item going to be marked out of? What type of grade do you want to show to the students (e.g. real, letter, percentage)? Is the assessment taking place online or offline? For example, assignment submissions and quizzes can take place online. Participation and in-class presentations take place offline. Access your course’s Gradebook from the course main menu link or via Course Administration, Grades. See how many items it includes. Some of them will be linked to an online activity (e.g. an assignment submission box or online quiz). Others may be manual items representing offline activities (e.g. in-class presentation, participation). See an example here. Select Full view of Categories and items to see how each of these items is set up. Are there any items you will not need? Are there any items missing? See an example here. To delete an item linking to an online activity: find the online activity in the course and delete it from the section where it is located. To delete a manual item: click on X on its right while looking at the Full view of Categories and items in the Gradebook. To create an item linking to an online activity: go back to the course section where you want the activity to be and create it. It will then automatically appear in the Gradebook. 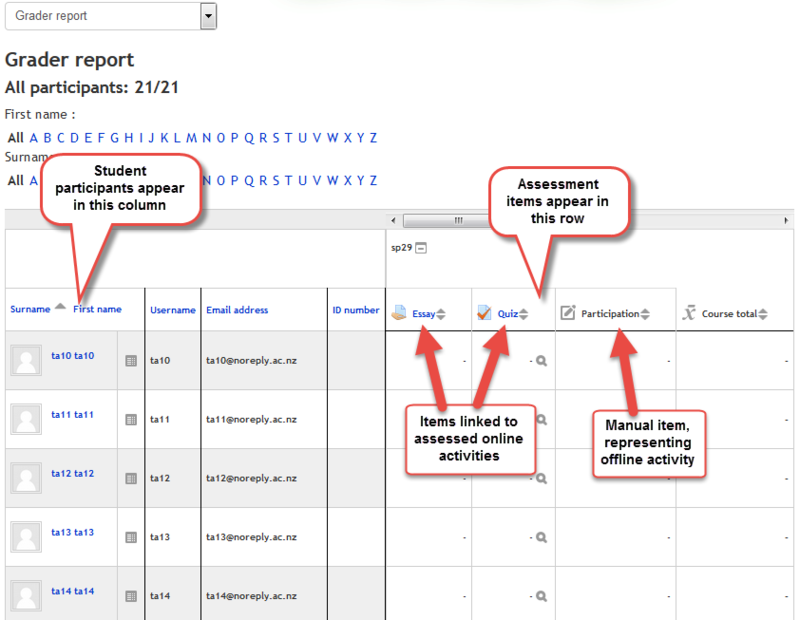 To create a manual item representing an offline activity: select Add grade item, while in the Gradebook, looking at Full view of Categories and items. Once you have all the items you want in the Gradebook, set up the aggregation method. The easiest aggregation method you can use is Weighted mean of Grades. This allows you to use different maximum marks and different weights. For example, a quiz may be marked out of 50 and have 30 as weight in the Gradebook. Make sure you Save changes when finished. 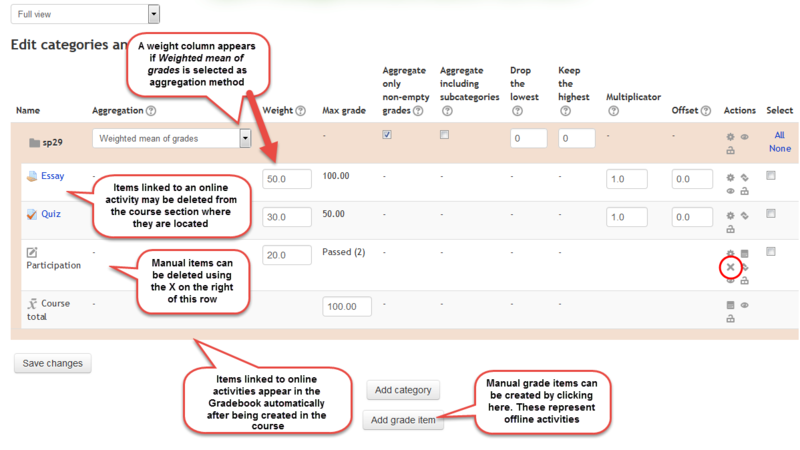 Other aggregation methods you may use include Sum of Grades (marks for each item are added) or Simple weighted mean of grades (an item’s maximum grade is used as its weight). There are other settings that you can configure in the Gradebook, such as grade visibility, type of grade shown to students (e.g. real, letter, percentage etc). Your Flexible Learning Advisor is able to provide you with additional support in setting up your Gradebook and looking at these aspects. Having your piece of paper with the notes described in 1 when you meet your FLA will help you both in setting it up easier and faster!